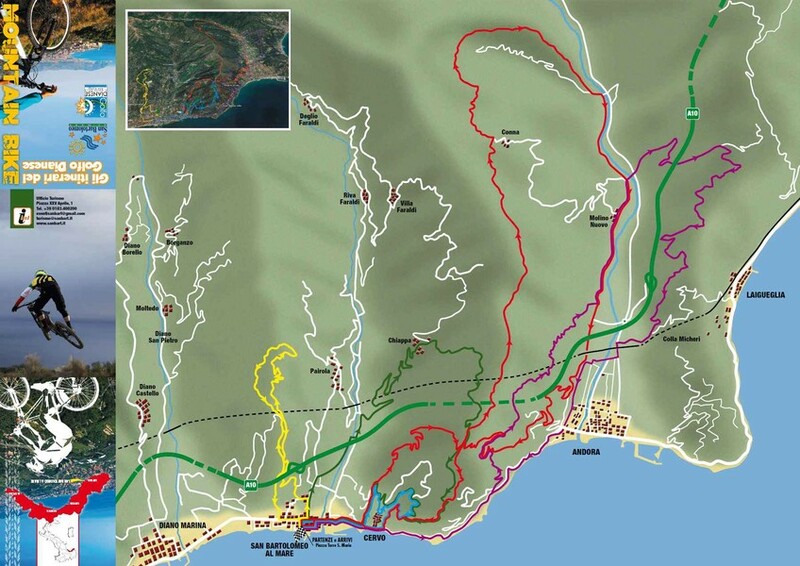 The map of Golfo Dianese MTB tracks is a valuable document that gathers the tips of the fans of the local sports federations, who have contributed so much to the creation of this magnificent sports park, which has nothing to envy of other Western Ligurian nobles. Route 1: Chiappa / Antennas / Dirt road Rollo / Parco Ciapà / Cervo. Route 2: Poiolo / Tornanti del Ceppo Nero / Pigs mule track/ Madonna della Rovere. Route 3: Cervo / Parco Ciapà / chicken line / Porteghetto. 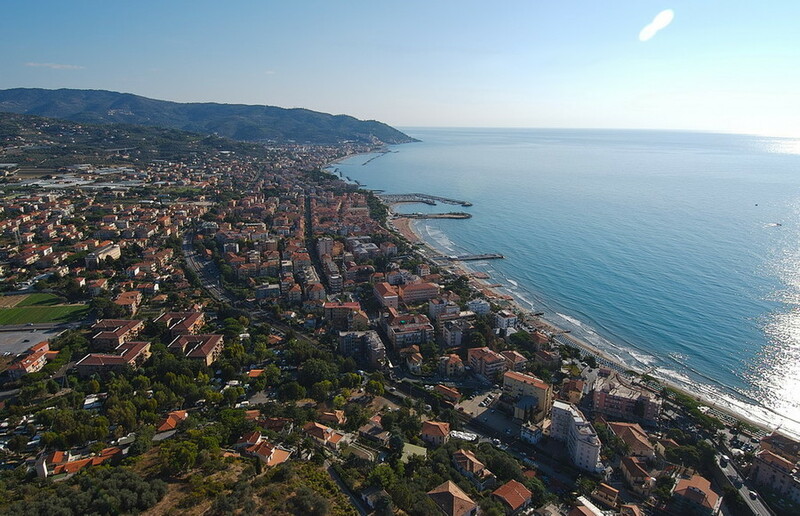 Route 4: Capo Mimosa / Rollo / San Giovanni-Andora / Former Campo Calcio Laigueglia / Castle of Andora / Via Aurelia / Cervo / San Bartolomeo al Mare. Route 5: Cervo / Direttissima Strada Morene / Cresta> Conna / Mulattiera "i Tecci" / Andora / Rollo / Chicken line / Porteghetto. The Golfo Dianese mountain bike trails are also available online and can be downloaded from the community website and other specialized websites. From the Piazza Torre Santa Maria, head towards the hinterland in the direction of the gentle ascent of the asphalt towards Chiappa. Once in the village, continue on a dirt road to the crest above the TV amplifiers. At the end of the ascent, do not take the single track, but a sloping road with breathtaking sea views, which leads into the city park of Ciapà, behind Cervo, to continue on asphalt towards Via Aurelia and from there to the starting point. There are no single tracks, but only asphalt and dirt roads. Recommended period: all year round; Length 14.8 km; Overall increase484 m; Average gradient 4.7%; Difficulty: easy / simple. From Piazza Torre Santa Maria, head towards Autostrada (Highway) and after about 200 meters turn left towards Poiolo; a paved ascent leads to a dirt road, which sometimes drops steeply, until you reach the Pig mule track that leads into San Bartolomeo al Mare to the area of ​​the sanctuary Nostra Signora della Rovere. It's a short but challenging ride, both uphill and downhill. Recommended season: all year round; Length 8.5 km Total ascent 367 m; Average gradient 7.4%; Difficulty: difficult. From Piazza Torre Santa Maria, take the paved road that leads from Cervo to the castle, continuing along the unpaved road that leads to Ciapà Park; From here you climb again to reach the area of ​​the TV antennas. Start an entertaining single-track called "Chicken Line" with a priceless ocean view that leads to the famous "Salto nel Blu". There are some challenging sections to watch out for. The route leads back to the Parco del Ciapà and then reaches the Via Aurelia in Porteghetto with a very entertaining last single track. 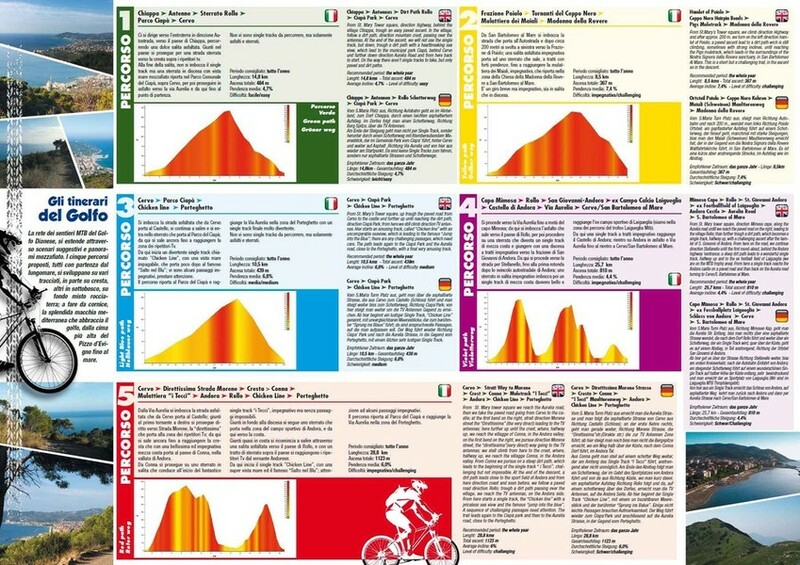 Recommended period: all year round; Length 10.5 km; Total climb 439 m; Average gradient 6.8%; Difficulty level: medium. From Piazza Torre Santa Maria take along Via Aurelia towards the Capo Mimosa until you turn into the asphalt road that leads to the village of Rollo. 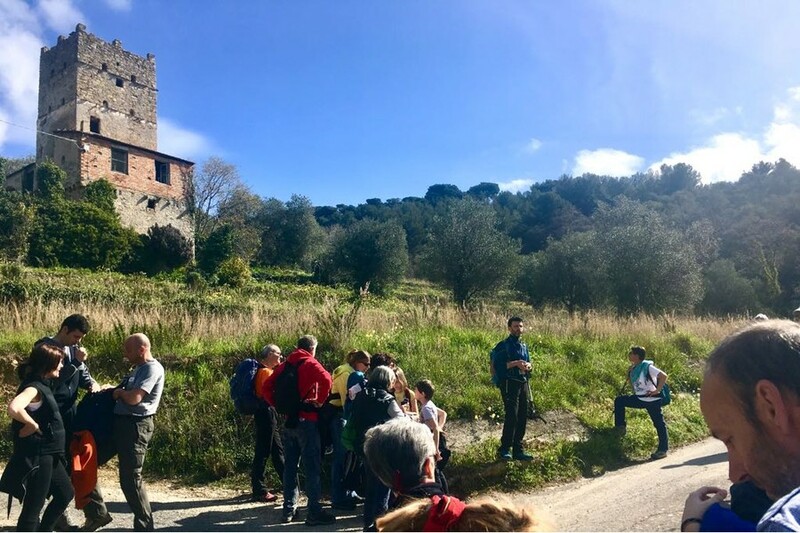 Then you will reach an unpaved road that will become a single track, halfway up the coast and the sometimes challenging descent towards the hamlet of San Giovanni di Andora. 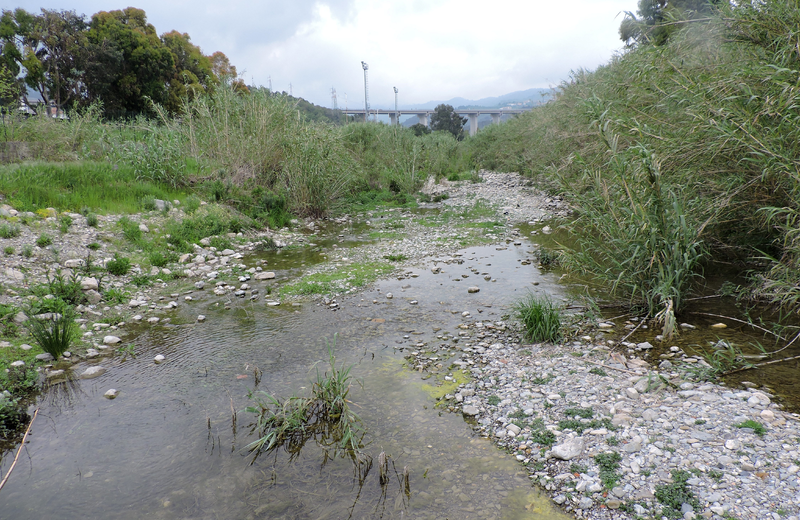 From here take the road towards Stellanello until the first roundabout after the Andora intersection. 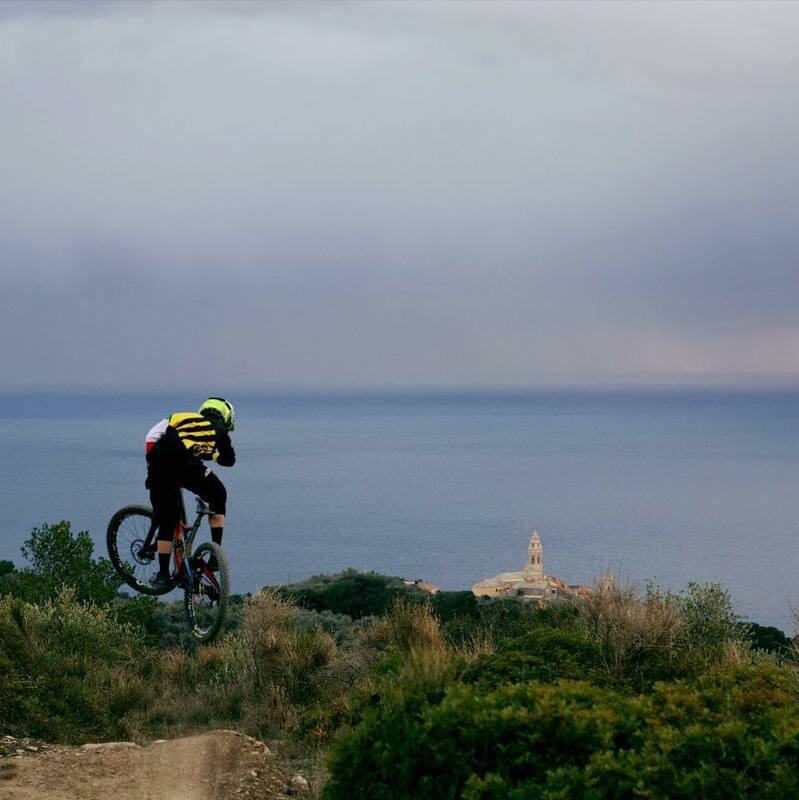 a gravel road uphill, then a single track halfway up the coast, which is really impressive and reaches the former sports field Laigueglia (we are in the area of ​​the paths of the Laigueglia MTB trophy). 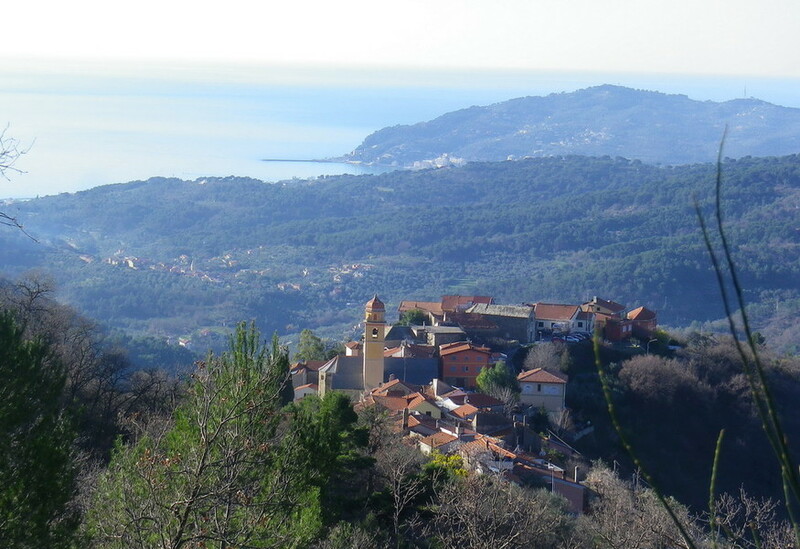 From here, a single track leads to the castle of Andora and on asphalt back to Andora to reach the Via Aurelia to Cervo / San Bartolomeo al Mare. Recommended season: all year round; Length 25.7 km; Overall increase 810 m; Average slope 4.4%; Difficulty: demanding. 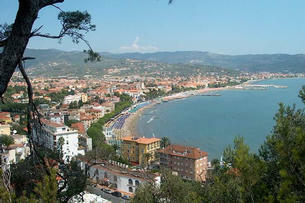 From Torre Santa Maria square, you will reach Via Aurelia and take the asphalt road that leads from Cervo to the castle. When you reach the first hairpin turn to the right, continue straight on to the Strada Morene, the "Direttissima", which leads to the TV antenna area. From here it goes up to the ridge that leads to the village of Conna in the Andora Valley. From Conna you continue on a dirt road that leads to the beginning of the singletrack "i Tecci", demanding, but without impossible passages. At the end of the descent, follow a dirt road that leads to the sports field of Andora and from here to the coast before taking a paved slope in the direction of the village of Rollo and reaching the TV antennas from the andorese side via a dirt road above the village. From here begins the single track "Chicken Line" with a priceless view of the sea and the famous "Salto nel Blu": Some non-simple sections invite you to pay special attention. The route leads back to the Parco del Ciapà and reaches Via Aurelia in the Porteghetto area.